Kayaks are a growing trend in the world of fishing, offering anglers an inexpensive and fun way to venture out beyond the shore. Before manufacturers started designing kayaks specifically for fishing, it required quite a bit of skill and practice to get the hang of snagging fish without tipping over. Modern fishing kayaks, however, are designed for stability. Many are so stable, in fact, they allow the user to fish while standing up! As with any vessel, though, fishing kayaks aren’t a one-size-fits-all product. There are a range of hull shapes, lengths, and formats to choose from. In this guide, we’ll introduce you to all our favorite kayaks in the fishing category. We’ll help you choose between the thin, longer models that are better for long journeys, and the wider models that are more stable, but aren’t as fast or easy to paddle. We’ll also explain why we picked our recommendations over the competition! The Sea Eagle Fishing Explorer is a robust, beefed up, fully accessorized version of the rugged Explorer Series. Designed by and for avid fishermen. Featuring: double layered, nearly indestructible, tough as crocodile hide, 2000 Denier reinforced protective layers, 6 built-in rod holders, forward and aft spray skirts with Sea Eagle exclusive accessory belts to hold your tools, hooks, and lures, a fully adjustable foot brace called the FlexBrace, 40″ FishRuler, anchor trolley D-rings, a huge max load capacity of 575 lbs., and is completely self-bailing. So bring on the roughest conditions and still get to those fish! Vibe Kayaks’ Skipjack 90 is the best compact fishing kayak on the market right now! It’s affordable, well-equipped, and easy for anyone to handle on their own. At 9′ and less than 50 pounds, it’s perfect for the solo angler who likes to keep things simple. While there are certainly bigger, more elaborate options, the Skipjack can compete with models three times its price for quality and execution! It’s nice and small! Compact kayaks are highly underrated, as far as we’re concerned. If you like to angle solo, and don’t have the frame to manage a big 12-foot vessel, something like this is perfect. It’s easy to transport, for a start. You can fit it in the back of many SUVs and pickup trucks. The whole thing weighs less than 50 pounds and has 4 carrying handles to make life easy. There are also advantages to having a smaller craft when you’re on the water. You can turn more easily, and you’ll have less weight to push about! The Skipjack 90 is not your average compact craft, though. In fact, it does as well as any Ocean Kayak for tracking and stability. We’ve found that it’s very easy to maneuver, and it handles wonderfully in bays and surf. Calmer waters are a piece of cake. That’s all down to the stable keel design (and, of course, the sit-on-top format). Since it’s such a nimble navigator on the water, you can take it practically anywhere. Unlike most other little fishing craft, it’s perfectly suitable to take on coastal fishing trips, as well as inland ventures. It’s much better equipped than other compact fishing kayaks. One traditional disadvantage with smaller models has been that they tended to be pretty bare-bones. Not the Vibe! It features two dry-bag storage compartments, with the liners included. There’s also a seat with a backpack built in and bungee storage behind the seat. Plenty of room for all the essentials, in other words! We also love all the options for positioning your fishing gear! There are 4 rod holders right from the factory, and there’s even room for a 5th. You can easily get a cooler in the back and take a smaller dog along. Despite its size, we’ve found that it’s still extremely comfortable, even for larger paddlers. The molded foot rests give you lots of options for positioning, without the trouble of adjusting the rests themselves! We can’t imagine anyone feeling cramped in here, even though it’s not as amply proportioned as our other picks. So, it handles well, and comes with all the essentials–but will it last? Oh, hell yes! We’ve recently become big fans of Vibe Kayaks for their high-quality construction and excellent quality control. There’s absolutely no reason why this shouldn’t last you for years. Vibe is also a good company to deal with, unlike most manufacturers at this price. They provide great customer service, and helpful online tutorials to get you started with setup and so forth. This is a company that stands behind their product! The Skipjack comes with a lifetime warranty on the hull, and 1 year of coverage for all the attached components. It’s hundreds of dollars less than the Perception Pescador, even though it’s about the same in terms of quality and performance. Sure, that’s partly due to the smaller size. Still, the Skipjack is an impressive value. You get a free paddle, too! The one notable downside we’ve found: the Skipjack’s factory seat isn’t great. We’ve heard some reports of snapped straps, even though we haven’t run into that personally. More than anything else, though, it simply lacks padding. Don’t buy a boat for the seat, though! You can easily swap the factory one for something better. Head over to our guide to the best kayak seats to find recommendations! Obviously, something this small isn’t ideal for bigger catches. Folks who chase bass would probably be better off with a larger craft, provided they can transport and handle it easily. But if you know you can’t handle something like the Pescador by yourself, stick with the Skipjack! Likewise, you’ll never track as well or go as fast in this as you would with a longer craft. This one is excellent for its class, but it won’t be for everybody! If you want more room, go for the Perception or one of our other larger picks. If speed and tracking are more important than nimble performance on coastal waters, you’d also be better suited with something longer. As anybody who knows Spanish can guess from the name, the Perception Pescador is made for fishing! It’s a fantastic all-purpose vessel and our recommendation to those who want to fish on a budget. While this isn’t the cheapest fishing kayak available, it’s the cheapest great fishing kayak we’ve found. It’s a nice midsize craft that suits both experienced and new paddlers alike! At 12 feet, it’s pretty manageable to move by yourself (if you’re strong) or with one helper. It’s roomy enough to be comfortable, without making it hard to transport. Overall, we think it makes a good compromise between compactness and roominess, and between quality and price. It’s very affordable for what it is. This is actually a rebranded Wilderness Systems Tarpon, which was a much more expensive vessel popular for a few years. The Pescador keeps the same stellar design, quality, and performance, but is much, much cheaper. It performs well in any conditions. The hull profile and shape give you excellent tracking for a relatively compact vessel. It’s also speedier than other small fishing kayaks, but it retains the stability you need for angling. You can use this on lakes, rivers, or coastal waters without any issues. Despite not being as deluxe as our pricier recommendations, it includes all the basics for fishing. It has day hatches at the bow, stern, and center for storing tackle. There are also two flush-mount rod holders, plus a caster rod holder. All in all, it’s fairly comparable to the Vibe Skipjack, only missing a rod holder and gaining a hatch. It’s both a great first kayak, and a compact alternative for experienced anglers who prefer something smaller. It’s affordable and user-friendly enough for beginners to enjoy, but if you’ve got some leagues under your belt, you won’t feel as if you’re missing much aside from room and some extra amenities. While our more expensive fishing picks are larger and have more amenities, they don’t offer substantially better quality. This is as rugged as you could want, and has a spotless track record for the long term. It can handle bumps and scrapes without issue. Despite the fact that it’s much cheaper than our other recommendations below, this is still not a small purchase. We think you get a lot of value out of it, since you can paddle it absolutely anywhere and you get all the essentials. It doesn’t have all the dry compartments and bait storage features that you’ll find on the Stealth 14. Nor does it have all the cubby and hatch options we love on the Hobie. You don’t have rudder options, either. Of course, all those things are true of the Skipjack. The point here is that the Pescador Pro is starting to get into the price range when you start to see those extra features. This is our favorite midsize craft. It’s a nice balance between tracking and speed and compactness and maneuverability. If you want a bit more room, though, go for the Sea Ghost below! Our recommendation to folks who want a big, deluxe fishing craft is the Vibe Kayaks Sea Ghost 130! Like the Skipjack and Pescador Pro, it’s a sit-on-top kayak designed specifically for angling. It offers ample room for gear and catches, plus speed and tracking that smaller craft just can’t compete with. Some folks will need a helper to get this to the water, but it’s worth the effort! The Sea Ghost is the best thing on the market for the passionate angler. It’s the longest of our Top Three picks. This is our recommendation to anyone who wants a larger vessel for fishing! There are several benefits to going with something as long as the Sea Ghost 130: improved tracking, faster speeds, and even better stability. That’s all beside the extra room, of course! We think this is as large as most people need. It performs with all the finesse of a bigger ‘yak, but isn’t as unwieldy as something 14+ feet. Quite frankly, performance with the Sea Ghost is outstanding. We don’t say that lightly, either! We were always fans of the Malibu Stealth series, but the cheaper Sea Ghost actually outperforms that model! It strikes a very impressive balance between the agility and ease of smaller craft and the sure tracking and stability of large vessels. It has an integrated rudder system. That’s the biggest difference between this and our cheaper/smaller picks. A rudder like this one helps you stay on track in conditions where crosswind and current are at play. If you’ve used a ‘yak with a rudder before, you’ll know how useful they can be. If you haven’t, suffice it to say that you’ll use it practically everywhere. You steer with your feet, using toe controls. Or, retract the rudder as you like. The toe controls are convenient and intuitive. While it might not be as agile as our smaller picks in the surf, it’s still very much at home in coastal waters. That’s actually one area where the rudder and improved tracking come in handy! You might not be able to maneuver as quickly, but you’ll find it easier to stay on course and tackle longer paddles. You can safely stand in this one! While some folks are certain to try that in our smaller recommendations, the Sea Ghost is the only one (aside from our See Also recommendations) that we’d consider standing-safe. Even larger folks will find that it makes a very stable platform. Aside from the performance advantages you see in a longer craft, the Sea Ghost’s obvious leg up is its additional room! There’s space on board for all your gear. Not only can you get all your tackle, but there’s plenty of space for a cooler and dog, even if you brought everything but the kitchen sink with you. It gives you lots and lots of options for mounting your gear. You’ve got two flush-mounted rod holders, plus 4 integrated gear tracks so that you can go to town rigging things up! This is one ‘yak that you can’t help but appreciate for the thoughtfulness of its design. It’s clear to us that anglers thought through all the features! It’s perfect for folks who like to use fish-finders. There’s a transducer port preinstalled, plus mounting points and a protective lid component. Unlike the Skipjack, it comes with an excellent seat! The Hero seat is adjustable and amply padded. We think it’s comfortable enough to skip buying anything aftermarket. We already noted in our review of the Skipjack that Vibe Kayaks is a great company to do business with. It’s worth repeating here! The Sea Ghost is very well-made and there aren’t any quality control issues we’ve come across. It’s covered by the same lifetime warranty on the hull and 1-year warranty on attached components. While this is certainly pricier than the smaller vessels above, it’s still quite affordable for what you get! The Sea Ghost is of comparable quality and appointments to many models twice its price. It’ll cost you around a grand. That’s no small purchase for most people, even though there are plenty of vessels that cost more. This is something we recommend only to committed anglers who will be sure to get their money’s worth. It’s on the large side for one person to lift/transport. At around 80 pounds and 13 feet in length, most people will need a helper or a kayak rack that helps lift. As with any larger craft, this one takes a bit more muscle to handle on the water than the Pescador Pro or the Skipjack. Still, it’s much nimbler than anything else we’ve reviewed at 13 feet! This one has a rudder, which is good news for stability and tracking. However, it does mean that you have to use adjustable footrests, as opposed to having the flexibility of the molded rests in the Pescador Pro or the Skipjack. These are some other craft that haven’t made our top three, but still deserve consideration! Some, like the Stealth 14, are lesser-known because of their size, but nice alternatives to consider for folks who like big ‘yaks. Some, like the Hobie, are ultra-premium paddle-driven vessels that are absolutely phenomenal but beyond the reach of the average buyer. Check them out below! The Malibu didn’t make our top picks above because of its inordinate size, and its very high price (considering how old the model is). We think most buyers will be better off with the Sea Ghost above. Still, if you want a big vessel, the Malibu remains a winner! This is a big, deluxe kayak. The Stealth is 14 feet, 4 inches long, and 32 inches at its widest point. The hull shape is supremely stable, and the Stealth tracks well and is relatively easy to paddle. If you’ve ever ridden in a big boat car, this has a similar ride. It’s smooth and steady all the way! It’s equally at home in rivers, flat lakes, and the choppy surf, like the Pescador. This is a big vessel, so it cuts right through any conditions. Anywhere you want to fish, you can take the Stealth 14! Thanks to its extra girth, it’s even more stable than the Pescador. You can easily stand on the dedicated platform in the middle of this one, and it’d be extremely hard to roll one of these over. While many fishing kayaks compromise a great deal of speed and maneuverability for stability, this one finds a solid middle ground. It has superb stability, but it still cuts right through the water and turns easily. That’s another reason the extra length is good: it makes it a much more navigable choice than many clunkier fishing models. The ample storage space you get on a big boat like this means anglers no longer have to pick which equipment to bring, and what to leave behind. It has ports on both sides for storing supplies, gear, tools and snacks. There’s a Gator hatch in the bow that also doubles as a seat for little ones, and a bungeed well at the stern that can hold a 5 gallon bait bucket. One of the best features of the Stealth 14 is the patented “live bait tank” in the center. This container has a plug that lets in water to filter in and flush out, allowing the fisherman to store live bait in the console. Alternatively, you can leave the plug in and use the center container as another water-tight storage space. Whichever way you use it, it’s a convenient and innovative feature. Both experts and beginners love the Malibu Stealth. The stability and smooth ride make it easy to get the hang of, but the quality and performance means that beginners may never need to purchase another. 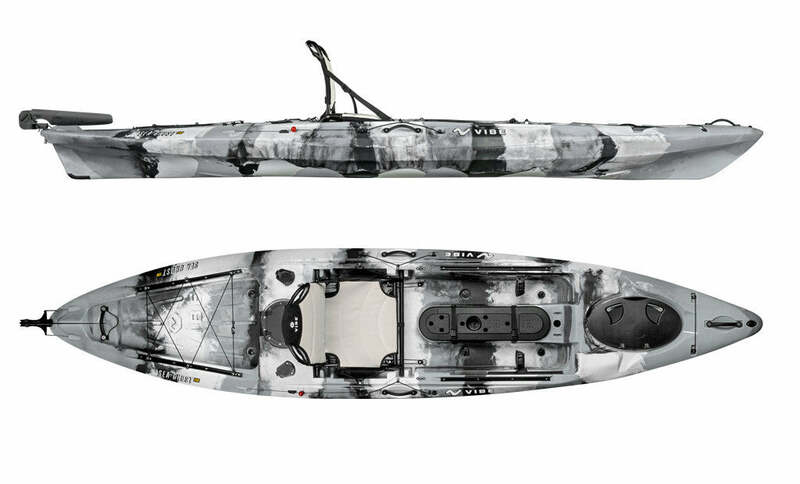 If you’re an advanced/experienced boatsman, this could be the last kayak you ever buy! Like the Pescador, the Stealth 14 is a rock-solid investment. The hull is rugged, everything’s well-made, and it has a great track record of performing perfectly for years of regular use. It’s also covered by a lifetime warranty, so you’re guaranteed to have it work as long as you want it! We don’t have any complaints about the Stealth 14. It’s simply a superb vessel. With that said, if you poke around online for reviews, a few previous buyers note that the cargo hatches on their 14’s had a tendency to leak. Apparently, this is an issue with the older models that Malibu fixed, and many of these complaints came before the update. We’ve kept the Hobie as a See Also pick rather than one of our main recommendations, simply because it’s so gosh darn expensive! Still, it’s absolutely phenomenal. This is the 2017 model, which has won plaudits from amateur and pro reviewers alike. We think it’s the best paddle-driven option on the market! Outside Magazine and several other periodicals agree. While there are some other standout features, it goes without saying that the Hobie’s distinguishing feature is the pedal-drive system. We know: the thought of pedals on a kayak might conjure up visions of slow-moving and cumbersome paddle boats, but we’re big fans of the MirageDrive feature. It’s a speedy and convenient way to get around that that leaves your hands free for fishing. After all, you can hardly cast a line with a paddle in your hands! The pedals make this one an excellent choice for people who want to fish a river without drifting steadily downstream. You can pedal yourself in place while you fish. They can also be a more convenient way to move against high winds. The seat on this model is another well-designed feature we love. It’s adjustable, allowing users to set the most ergonomic position for paddling or pedaling. The seat also has lumbar support—great news for fishermen with bad backs! It’s a much more comfortable design than other models on the market, as well as many aftermarket seats you can buy. As with the Pescador and Stealth 14, the Mirage Outback is impressively stable. Despite the pedals, it’s still a sit-on-top design, so it can handle currents and wakes with ease. Its extra weight also comes in handy there. Like our other picks, you use it anywhere, although most people don’t find pedals useful at sea. It tracks well enough to handle the surf, and isn’t too bulky for longer lake jaunts. What’s particularly helpful in rough waters is the retractable rudder for better tracking and maneuverability. It’s as well-outfitted as the Stealth 14, only in a smaller frame like the Pescador. The Mirage Outback comes packed with tons of excellent features, including rod holders, a gear bucket and a cargo area. If you feel like changing up your boating routine a bit, the Mirage Outback also comes with a sail mount! We love the amount of accessible cargo space that the Outback provides. With pockets, rod holders and storage space, this model allows you to bring absolutely everything you need for the ride. It’s even wider than the Stealth 14, which is why it’s roomier than other 12′ options. It has all sorts of different storage options, as well as ample room. There are cupholders of different sizes, cubbies on the top of the hull, bungee pockets, and some additional hatches throughout the body. You’ll also have the rear well and long running shelves for general storage. The price of this model will likely be the main drawback for customers. Though few owners regret the purchase, the Mirage Outback is by no means an inexpensive model. You could get several Pescador’s for the price of one Outback. For some, the non-traditional pedaling option may not be appealing. It’s only a must-have feature if you regularly fish in rivers, or if you simply enjoy the leg workout. However, if you’re not going to use it, you could easily save money by going for the Pescador or even Stealth 14. The Mirage Outback is on the heavier side, thanks to the heavy-duty hull material and pedal-drive mechanism. So, paddling long distances can be something of a chore. The weight also makes it more difficult to move on land by yourself, so some kayakers may need to enlist the help of a friend . The sturdy, balanced Lifetime 10 Foot Sport Fisher Tandem kayak is a respectable little fishing kayak if you’re on a very tight budget. While its quality control issues and cheaper build quality keep it out of our top three, we think it’s by far the best thing for fishing under $500. The simple and stable design of this kayak is perfect for beginners and recreational anglers. It’s designed for maximum stability, allowing anglers to stand up while they cast or sit sidesaddle. Take a look at this if you’re not sure you can justify the expense of the Pescador! It’s also sold at an extremely low price point, and is even more affordable than the Pescador. This is one of the cheapest kayaks we recommend in any category! For a small craft, it’s roomy and comfortable. The Sport Fisher is a shorter tandem kayak that can hold up to three people, though it can also be paddled by a single person. The seats are higher up off the water than other kayaks, allowing users to stay drier and more comfortable out on the water. It comes with padded backrests, 3 rod holders and a 6 inch storage hatch. The Sport Fishers also features paddle clips and cradles for when you aren’t paddling. The stable and sturdy Sport Fisher is ideal for less experienced kayakers—steady enough to not tip over, and small enough that it turns rapidly away from danger. Families in particular will appreciate having a safe, multi-person kayak for their children to enjoy trying fishing out. The stability isn’t just ideal for beginners and families with little ones, however. Any angler, experienced or otherwise, will enjoy being able to stand up in their fishing kayak. Although many fishing kayaks allow the user to stand up, that level of stability is difficult to come by within the entry-level price bracket. While our main picks above beat the Sport Fisher in every performance category, it’s hard to argue with the safety factor of this one. With a weight capacity of 500 pounds, the Sport Fisher accommodates a variety of body types with comfort and ease. Plus, it stays very steady with multiple people onboard. The Sport Fisher is a pretty heavy kayak—-roughly 80 pounds when empty—which will make it difficult for many users to carry alone. It’s also a bit more awkward in the water than our sleeker, lighter main picks. This is a case where you definitely get what you pay for in the design department! Additionally, the design of the Sport Fisher isn’t built for speed or tracking. 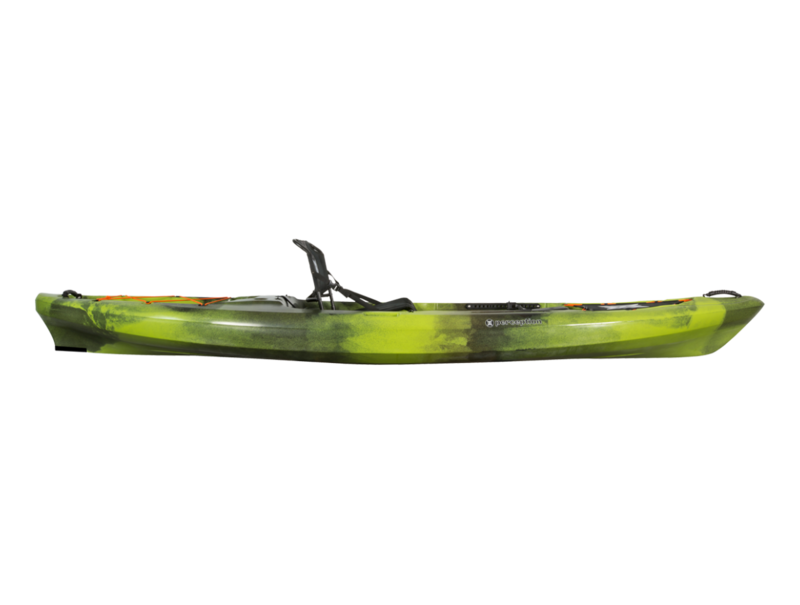 The Sport Fisher is best suited for bodies of flat water or slow-moving currents, and will not perform well as a touring kayak or most recreational models. It’s not so good an all-purpose vessel as our other recommendations. Persistent quality control issues affect some units, and that’s not something to take lightly when you buy a kayak. With something this large and expensive, you shouldn’t have to deal with cracked hulls or leaks out of the box. That’s unfortunately an issue for the Sport Fisher. It also has pretty light build quality compared to our other recommendations. While the Pescador is practically indestructible, for instance, we’ve heard enough reports of damage to Sport Fishers that we can’t recommend it with full confidence. Which Fishing Kayak is Perfect for You? If you’re on a tighter budget, or simply prefer something compact, go for the Vibe Kayaks Skipjack 90! It’s very manageable for solo anglers–both on the water and on the go. It handles well in all conditions and is remarkably well-equipped for something so small and inexpensive. Don’t expect this to track as well or go as fast as our larger recommendations, though. Some folks will also find it too compact for their needs. Our top quality pick for folks who want a larger vessel offers a lot of value to beginners and expert kayakers alike. The Vibe Kayaks Sea Ghost 130 is roomy, stable, and still reasonably affordable. It’s the fastest of the three on the water, and also the most spacious. 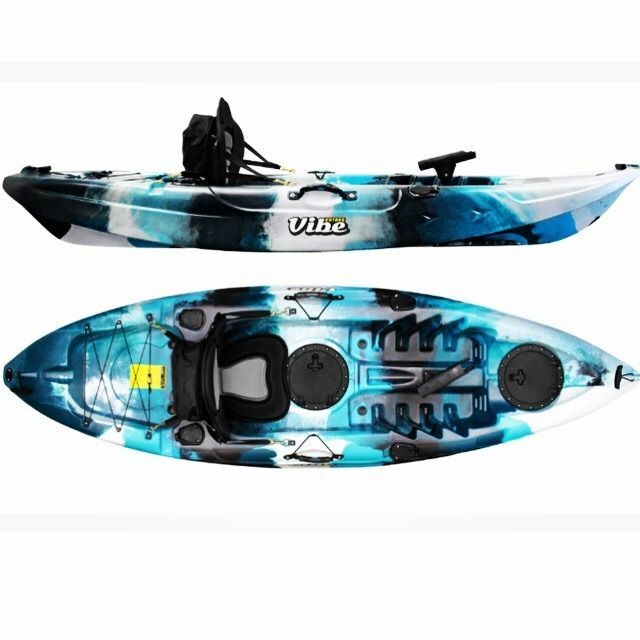 If you’re a dedicated boater looking for a stable, versatile fishing kayak with lots of available space, we recommend the Vibe! Our recommendation to the average buyer is the Perception Pescador Pro. We think it’s an excellent middle ground between compact ‘yaks and deluxe models like the Sea Ghost 130. It’s manageable for a strong paddler to carry solo, and gives you the best of all worlds. Plus, it performs extremely well in all conditions. It’s of no lesser quality than our other recommendations, and the only limitations are the size and lack of rudder. Buyers with a much bigger budget may also want to check out the Hobie Mirage Outback. This one’s a bit of an oddity, since it has pedals built in. MirageDrive makes fishing on rivers a breeze, and the ample storage space, speed, and stability of this kayak makes it a favorite of many experienced anglers. It improves on many aspects of the Malibu, but it does cost significantly more. We don’t recommend it to casual anglers. This one’s a better choice for someone who will get a lot of use out of it, and enjoy the option of pedals. -Do you need room for a cooler? -Do you want mounts for your rod, or will you be doing everything manually? -How many lines will you be using at any given time? -Are you fishing alone or with a partner? -Will you have room for lunch, or need room for a dog? -Where will you keep your baits and supplies? -Do you have a convenient place to store the boat near your fishing location, or will you need to think about transport options? -How often will you be out on the water? -Will you want to use your boat for recreational jaunts, or just for catching fish? If you’re looking for more kayaks that are great for fishing and recreation, check out the Amazon best sellers page for fishing kayaks! You can also visit our homepage for more of our top kayak reviews.